After the fifteen-story Sky Scraper giant wheel opened in 1991, two seasons had passed without any new rides. 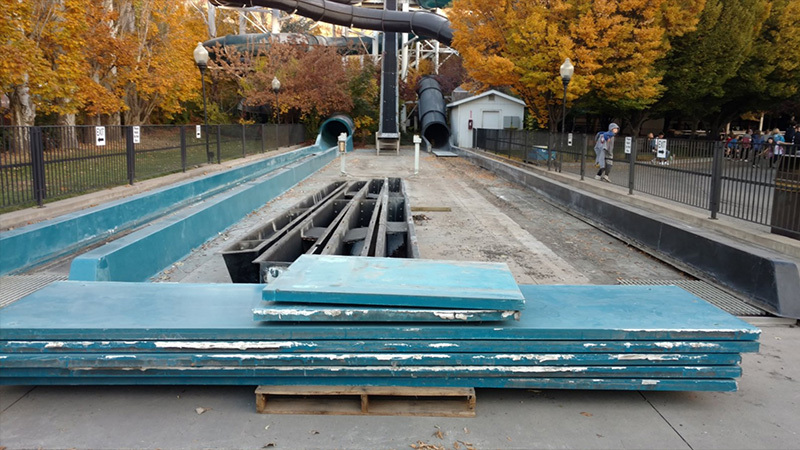 While considering a WhiteWater West Water Coaster, Lagoon was uncertain whether or not it would be a good addition to the park. They acknowledged that it looked like it should be in Lagoon-A-Beach, which was only five years old at the time. 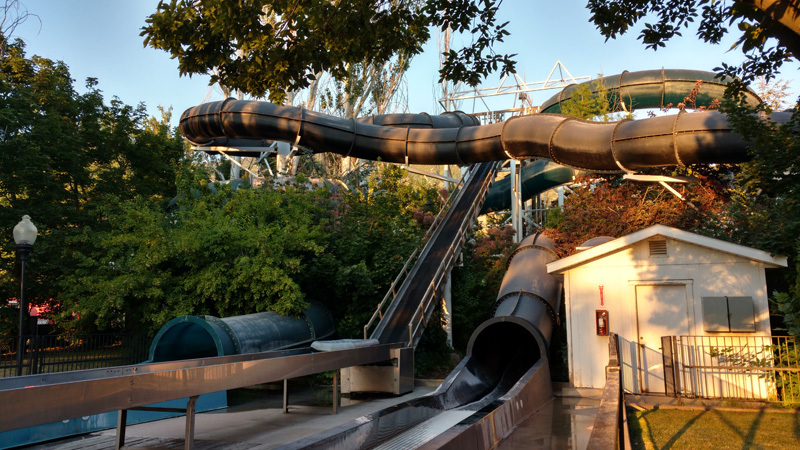 It wasn’t until after consulting with management at other parks that were happy with theirs (including Six Flags Magic Mountain where Yosemite Sam’s Sierra Falls had just opened) that they decided to install one. Luge is an Olympic sport where athletes ride a small sled (called a luge), face up and feet first. Perhaps Lagoon chose the name Hydro-Luge because of the similarities between the ride and the sport. But it may have also had to do with the local population’s growing anticipation of the Winter Olympics coming to Salt Lake City in 2002. At the time, a bid had submitted and venues were already being constructed. 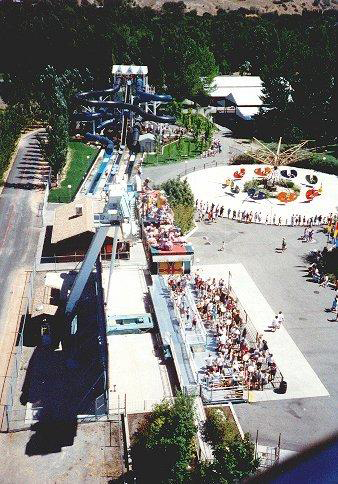 In fact, ground was broken for the bobsled and luge track near Park City in June 1994 – the same month Hydro-Luge opened at Lagoon. It was located east of the Flying Carpet (which was later replaced by Samurai) on a piece of land just inside what had once been the Race Track. Lagoon opted for two different tubes. One was a regular, blue translucent tube and the other was a black opaque tube. For many years, riders had to decide on a tube before getting in line. The staircase had a railing down the middle and each side led to a different tube. The black tube was almost completely dark, making each turn more surprising, but also much hotter than the blue tube. Hydro-Luge would often be closed in colder times at the beginning and end of each season. But in 2017, it didn’t open until mid-July and only operated for about a month before closing again. A forum user at LagoonIsFun.com found the ride had been put up for sale in December 2017. When the park re-opened in March 2018, everything had been removed except the tower, which was taken down mid-April. It’s now sitting in pieces near the Frontage Road waiting for a new home. Lincoln, Ivan M. Lagoon hits high speeds onstage. Deseret News, 27 May 1994. Olympic Bid Timeline. Deseret News, 16 Apr 1995. Hydro-Luge. LagoonIsFun.com, 1-12 Aug 2015. Water Coaster. WhiteWaterWest.com, accessed 4 Mar 2018.